Pleasing the stomach isn’t just the way to a man’s heart, it’s the way to everybody’s heart. Passing down recipes and sharing them can be quite a hassle. To solve the problem, making a cookbook catalog would be a smart move. This catalog would not only allow you to easily share recipes, but rather organize everything in a systematized way. This article would be teaching you how to make an effective cookbook catalog. Before opening a blank canvass or using a template, you should come up with a central theme for your cookbook catalog first. On what kind of cuisines or meals will your cookbook catalog revolve? Is it a cookbook on formal dining? Is it for Asian cuisine? Grilled meats? Take note also that you as an author must be knowledgeable about the content of your cookbook. If you are trying to author your own cookbook catalog, of course it would be suggested that you use photos of your own cooked meals for illustration. Hire a professional photographer to take the photos for you if you aren’t quite sure about producing good photos. Make sure that the photos are well lit, clear and sharp, and colorful enough. If you are using a cookbook catalog template, you can easily replace the built in texts with your own texts. If you are starting on a blank canvass, after working through your layout, type in the text for your catalog. Make use of shapes and boxes to organize your texts. Choose a font type that will make your texts legible, and preferably something that will fit the theme. Take time to work on your cookbook’s layout. Decide on how will you arrange the contents, would it be from appetizers to desserts? In designing your cookbook, remember to keep it simple and concise. Use a maximum of three complementary colors, or you can consult a color wheel. Don’t overwork the design of your cookbook catalog. Step 5: Print or publish your cookbook catalog online. 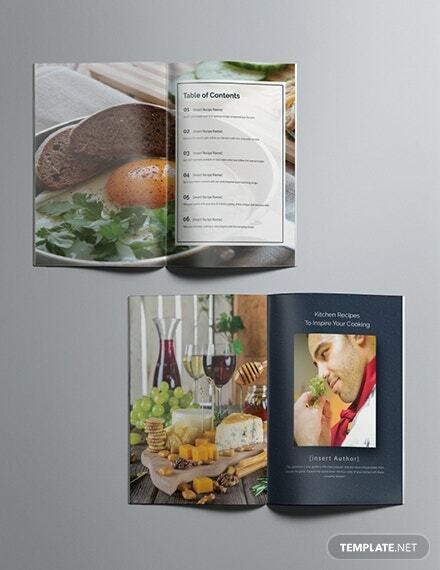 Do a print preview of your cookbook template before printing it. It is also advisable that you print a mock up first before producing your catalog. In catalogs, use a thick stock paper for your printing medium. This is necessary as to help your catalog become durable. Use a glossy finish paper. Save your template in a file format that will allow it for publishing online. 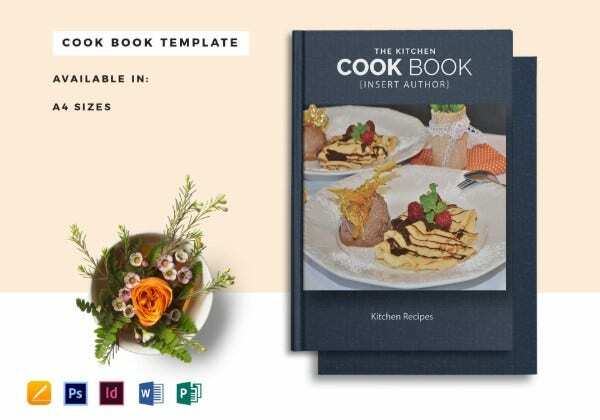 Download this Free Printable Cookbook Catalog Template today for a cookbook catalog that will guarantee you a high quality material. This template uses royalty free graphics with well-written content made by a team of professional graphic artists and writers. This template is also fully customizable and editable. Grab this Printable Cookbook Catalog Template today. This template is first rate and only uses graphics that are high in quality for a template that is worth your money. Invest in this marketing tool without hesitation because this will surely give you more than what you paid for. Get this template today! If you want something that will stand through the years, nothing is more durable than this Hardbound Cookbook Catalog Template. Pass down recipes from generation to generation with this quality template. Easily edit the built in texts with your own content with is customizable features. This template is the best for you. Looking for a quality template? 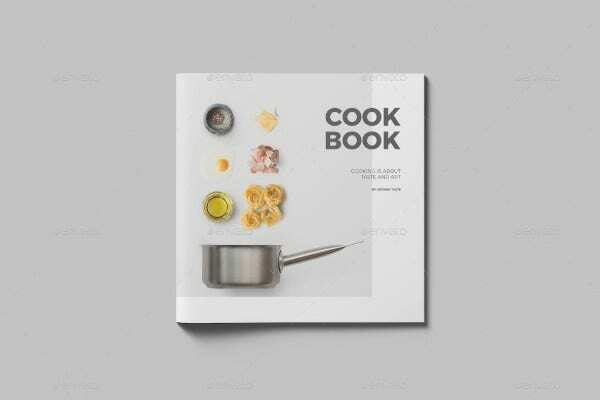 Look no further and download this Square Cookbook Template. It has an effective layout that will surely organize your recipes in one neat cookbook. The design of this template is dedicated to make it look neat and simple as to not distract the eyes from the content. Grab it and make it yours! 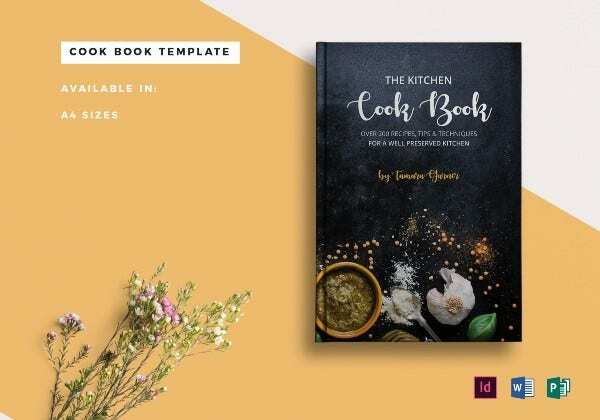 Every recipe deserves to be shared to other people, and so every cookbook author needs a template as good as this Simple Cookbook Catalog Template. You can count on this template to best represent your published material. This template has a minimal design making it fit most especially for millenial cookbook authors. 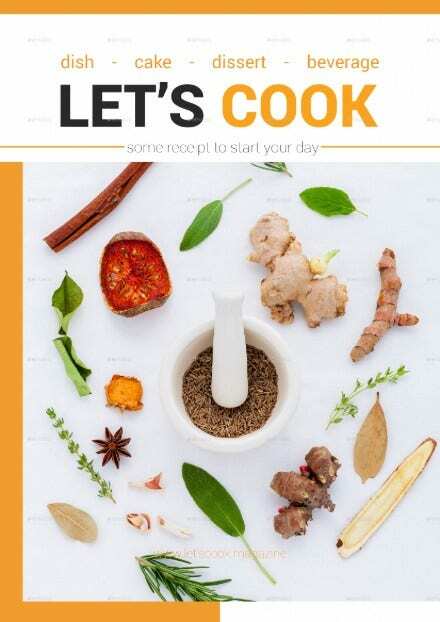 This bright Let’s Cook Cookbook Catalog Template can be yours and you’re just a click away from it. 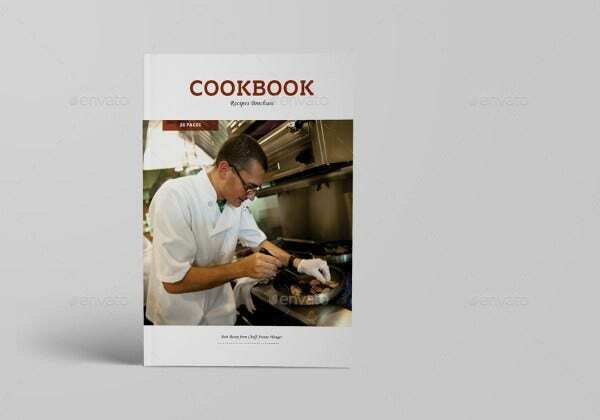 Download this high quality template today and use it to publish your cookbook material. Why choose this template? Because it’s user-friendly, it can be downloaded on any modern device so you can edit it on-the-go. 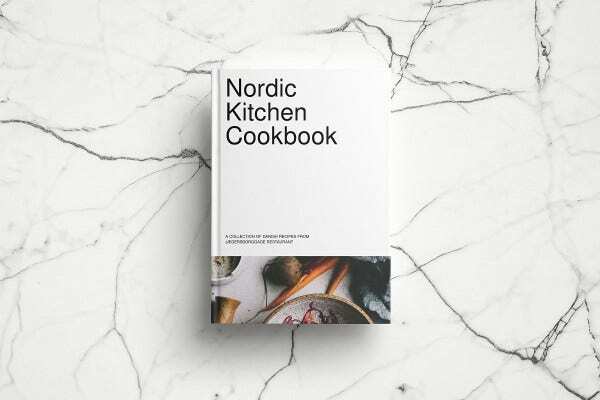 With the hundreds of cookbook templates made readily available online, this Nordic Kitchen Cookbook Catalog Template belongs in the top category of first rated templates. Why not? This template has everything you need in a cookbook catalog. It has well written content, high quality graphics, and a printable format. Get this today!